Researchers at the University of Rochester Medical Center have begun working on a 10-year-long study involving more than 10,000 children across the U.S. The study, which will track children through adolescence into early adulthood, is designed to understand how experiences such as social media, video games and smoking in childhood can influence development. 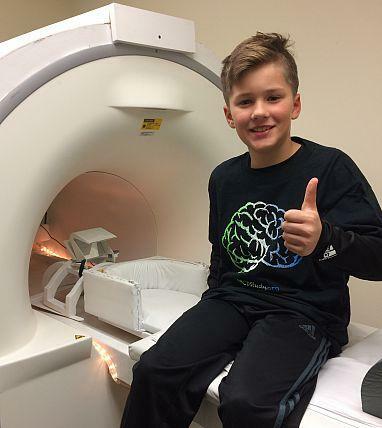 A child prepares for an MRI scan at a university in South Carolina that is participating in the same national study of child development as researchers at the University of Rochester. More than 300 youths from the Rochester area are included in the study. They’re all 9 or 10 years old, and their participation involves being interviewed by researchers, filling out surveys, and solving puzzles as researchers look on. Sometimes the children need to be at the university for an entire day. Ed Freedman, who is one of the principal investigators at URMC, said gaining their full attention can take some cajoling. URMC is one of the last of the 21 sites involved in the nationwide study to finish enrollment. As a result, national coordinators had some particular requests for recruiters locally. “One of the holes in the demographics of the study overall was recruiting people from a city, and we felt we could do a good job with that,” said Freedman. The team at URMC “recruited pretty heavily from city schools,” Freedman said, and local education officials were happy to oblige. “It’s exciting for Rochester to be a part of the trailblazing (study),” said Ray Giamartino, the Rochester City School District’s chief accountability officer. And recruiting participants from a wide range of racial, ethnic and socioeconomic backgrounds means introducing them all to science at an early age, Freedman said. The primary aim is to gather good data from the children to understand how their minds are developing, but “I think one of our secondary goals is that maybe this leads to them wanting to do science,” said Freedman.